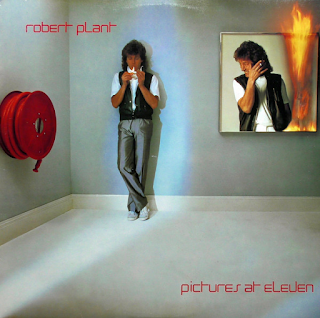 This was Robert Plant’s first solo album and came as something of a surprise to Led Zeppelin diehards. 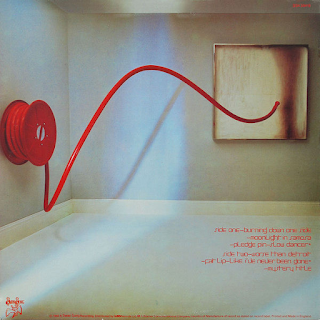 It is very much a product of its time and it features Phil Collins on drums for six of the eight tracks (Cozy Powell on the other two). It is culturally at odds with early eighties genres like post-punk, two tone and new romantic, but it is in line with the direction that mainstream rock was taking - all programmed synthesisers and drums and riffs played on keyboards instead of guitars at times. It is still early eighties enough to have not bowed completely to the great god synthesiser, however, and I much prefer it to some of Plant’s subsequent eighties work. “Burning Down One Side” is a thumping, riffy, rocking enough opener, despite some of its eighties instrumentation. It still retains a considerable power to it. “Moonlight In Samosa” is a lovely, slow, bassy ballad, full of atmosphere and featuring a winsome vocal from Plant. He, as he sometimes does, sounds a little like Freddie Mercury at some points. Some nice Spanish guitar on the track too. “Pledge Pin” has a quirky, appealing little cymbal-driven rhythm and some fetching guitar parts. It is a catchy, poppy number. It has a great saxophone solo (very Led Zeppelin - not). I can’t help but like it. It has a deep, resonant bass line. The lengthy “Slow Dancer” gives us our first serving of that familiar Led Zep vocal and “Kashmir’-style drum backing and orchestration. This will have satisfied the Zep fans somewhat, probably for the first time on the album so far. It has some good guitar riffs, but they are matched by keyboard ones. It is still a powerful number, though, Cozy Powell giving his best John Bonham on drums. He is the better rock drummer than Collins. You can tell. "Worse Than Detroit" has a bit of a "Zep funk" feel about it, like "Trampled Under Foot". It is the first track on the album, thus far, to feature a blues influence (that comes the harmonica/guitar instrumental interplay). The track rocks, considerably, in a grinding, industrial way. "Fat Lip" has a nice deep, bassy backing and an appealing feeling throughout. I really like this one. "Like I've Never Been Gone" features Cozy Powell's big drums again on what is a slow, powerful rock ballad, with some great guitar all over it. The final track is another chunky Zep funker, "Mystery Title". I read someone say, and it is true, that Plant frustrates because often his song titles bear no relation to the actual lyrics, therefore they don't stick in one's head as much as they might. It is a valid point. Take as a whole, however, this is still a strong debut solo offering. The songs are all good whether they individually catch your attention or not. The overall feel of the album sticks.